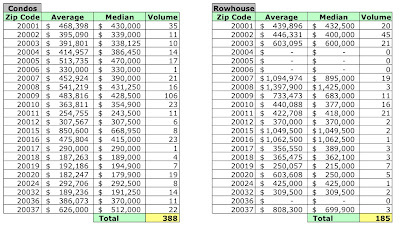 I've finished my analysis of full value residential sales the District recorded in July 2007. I was interested in seeing what this data would show given the rather robust July sales figures reported by MRIS. What I saw was somewhat muted. 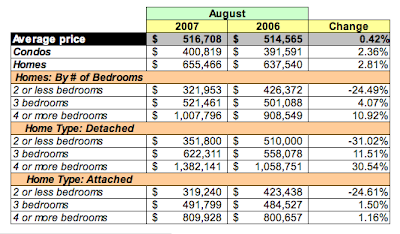 YoY, a larger number of condos sold, but for only slightly higher prices. Fewer homes sold, but sales at the higher end lifted average prices. 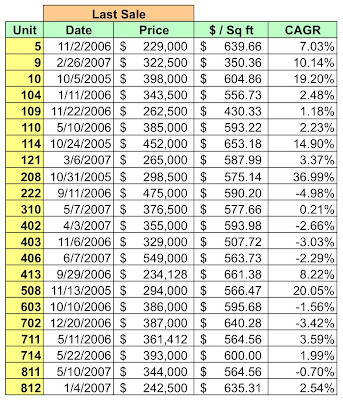 Eighty homes and condos, 10.5% 10.4% of all recorded sales, sold for $1MM or more. I now have physical information [square footage, number of bedrooms and bathrooms] for almost every District property except for those that completed construction within the past year. 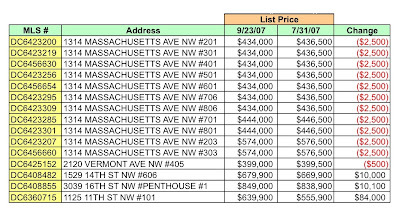 Consequently, the sales listings I mention below have price per square foot for many - not all - of the properties discussed in this post. See below for more detail. I found another District data error that's forced me to update many of the graphics and some of the text in this post. 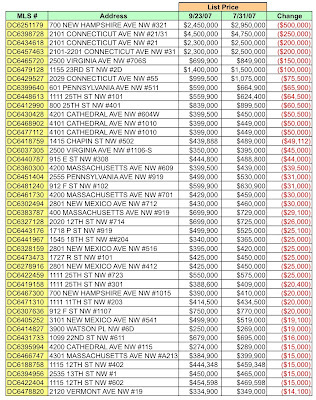 That $3.75MM home on Eastern Ave actually cost $375,000. 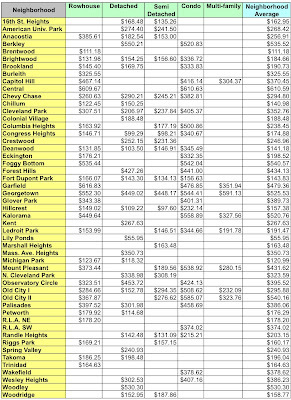 The data error was large enough to affect average prices for the housing category [detached], the ward , and the zip code . 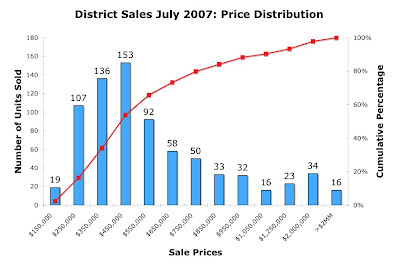 In July 2007 the District recorded 769 residential sales, 2.53% more than the same month in 2006; this excludes the two outliers I've mentioned in previous posts. 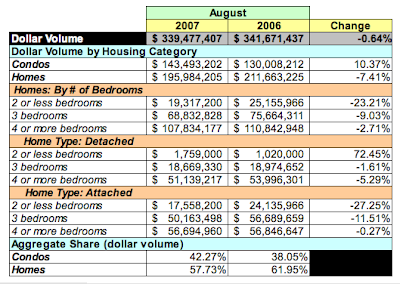 Unit sales were almost evenly split between condos and homes while, in terms of dollar volume, homes led 61.33% vice 38.67%. 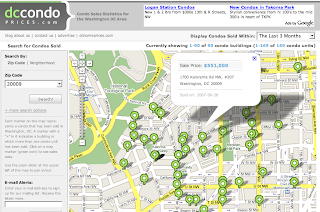 Condo sales also continue to dominate Wards 1 and 2. 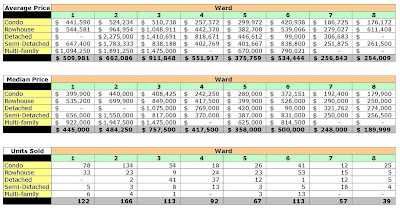 In Ward 1, 64% of sales were condos and in Ward 2, 80%. 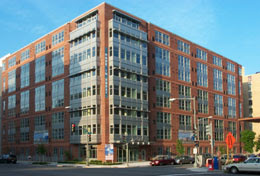 Condos represented 64% of sales in Ward 8. The chart below shows the distribution of July's recorded sales by sales price; 53.84% of recorded sales were priced $450,000 and lower. 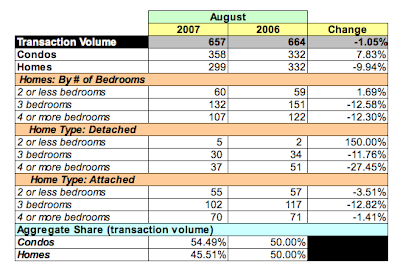 Of those, 61.6% were condos, 65.7% of all condo sales recorded. Average prices were up 5.65% in the aggregate; median prices were flat. 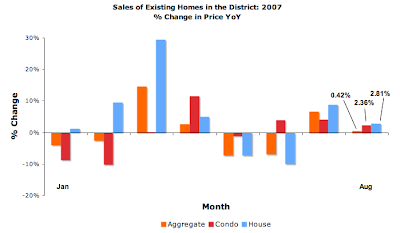 Condos had significantly higher unit sales volume, but without similar impact on prices. While May and June had fewer home sales recorded in every housing category YoY, July did slightly better - fewer home sales in 3 of 4 categories YoY. 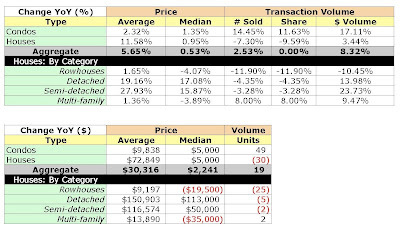 However, the housing category that did well - multi-family converted to single - was only 3.5% of all sales recorded. 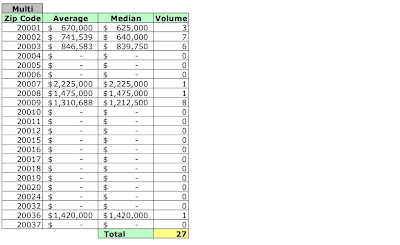 Those twelve buildings alone represent 20.4% of all condo sales recorded in June. 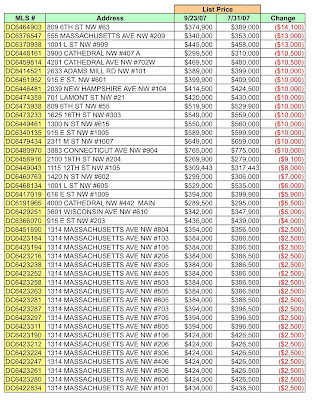 I expect sales from 1010 Mass will begin appearing in August's data; it'll be interesting to see how that building fares. Although overall demand for single family housing is down 7.3%, higher average prices in two segments [semi- and detached homes] enabled positive growth in aggregate average and median prices. 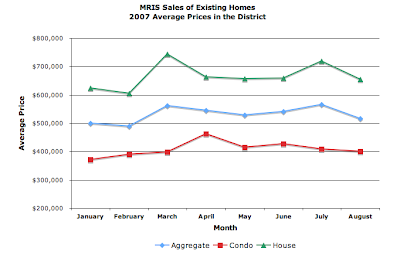 Average prices rose 11.58% although median prices were up less that 1%. Wards 3 and 4 accounted for 71% of detached home sales; the majority of semi-detached home sales were in Wards 4 and 7 [22% and 30.5%, respectively]. 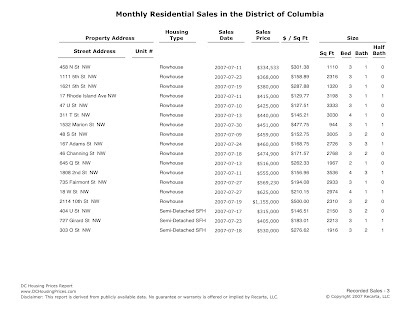 For $5.00, you can purchase a listing of all July home and condo sales recorded in the District that were discussed in this post. [Update] Information is available for all homes and condos. Note: I use the District's downloadable data, which usually has a 6-12 month lag; this means that the publicly available data doesn't include condos or homes completed within the past year. I'm using the District's appraisal data so the accuracy of my analysis is dependent upon the fidelity of the District's data. 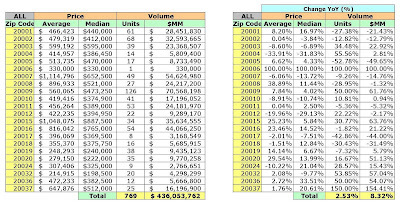 July 2007 average and median sales prices and unit volume by zip code. 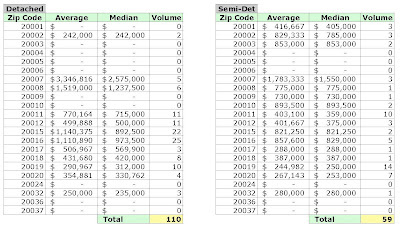 July 2007 average and median sales prices and unit volume by ward.